The sixth annual Dark Gathering has yet again an exciting line-up with something, hopefully, for everyone. So it’s time to give a bit more detail and introduce the performers to you. The day will kick off with spooky tales from Lisa Schneidau who is an experienced storyteller and environmentalist from Dartmoor. She will bring together her love of nature and the Land with a magical flair that I’m sure will enchant all who attend the session. The venue will be the library at the Museum of Witchcraft and Magic. Given the rarity of some of the books, there is an absolute ban on any food and drink being brought into the library with no browsing of books permitted on this occasion. 50% of the proceeds are being donated to the Museum of Witchcraft and Magic, and the Dark Gathering. Incidentally, later in the day you will also see Lisa again in a slightly different guise – as a Beltane Morris dancer! This year we have the welcome return of Wrecker’s Border Morris. They are our fun-loving local Cornish side who inject a little bit of benign crazy (or mazey if you’re Cornish) energy into the proceedings. Finally our Guest Side this year is the dark and mysterious Wild Hunt Bedlam Morris that haunt the wilds of Surrey. This is an experienced masked Border side that have been performing for 28 years. I am confident that Wild Hunt will bring their very own brand of the Otherworld with them to the Dark Gathering. During the afternoon break in dancing this year there is to be, Devonbird. This Devon based folk band are very much connected to the Land, together with it’s folklore and magic – this is reflected in their music. The Dashing Dynamic Duo that is Nik (Londoner) & David (Dubliner), combined collectively in the guise of their Stone Soup alter-ego, shall be bringing their Magniloquent Mayhemic Mix of Storytelling & Music to this fantastic event. Expect the Unexpected!!! So, we will once again have an action packed and exciting line-up this year, with some new faces which I’m sure will receive the customary warm Cornish welcome. I will announce any updates as and when they occur on this website. Remember to book accommodation early to avoid disappointment. 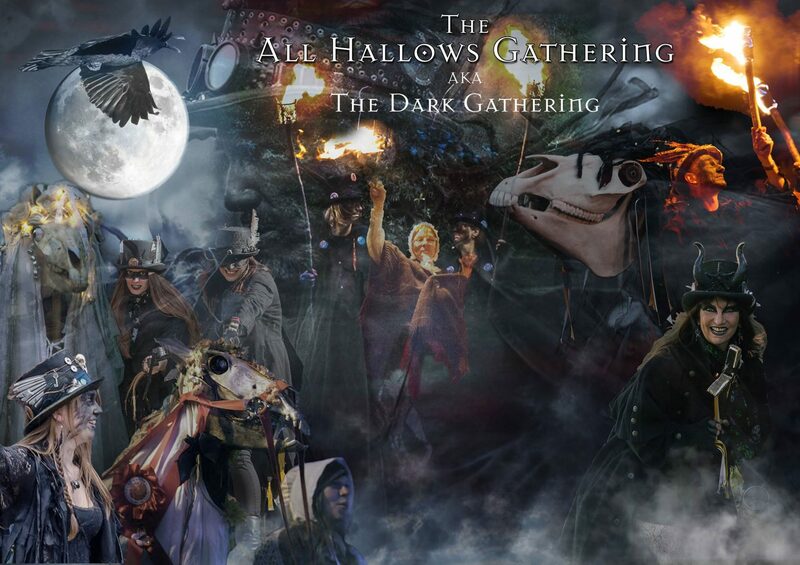 Reminder: Each year we have a Guest Side visiting the All Hallows Gathering. We choose from a list of Morris teams who have applied to come. If your side is interested in performing at Boscastle to help us celebrate this special festival at the Darkening of the year, then contact the event organiser via this website. Absolutely fantastic! So many layers of magical and wonder. Music Dance and Mystery.The gathering develops every year into an even more ‘must see’ experience! How exciting . Well done for all the hard work!